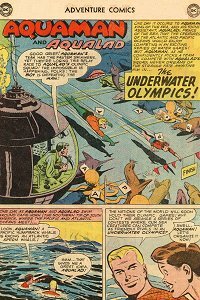 Adventure #277 (Oct 1960) - The Underwater Olympics! Aquaman and Aqualad arrange an Olympic games pitting the creatures of the Atlantic Ocean against the creatures of the Pacific Ocean. Quotefile: Aquaman, "The nations of the world will soon hold their Olympic Games! Why don't we arrange a series of contests where our sea creatures can compete as friendly rivals in an Underwater Olympics?" Aqualad, "Swell, Aquaman! Let's organize it now!" Finny Friends Report: The idea for the Olympics are inspired by a Pacific Humpback whale racing an Atlantic Sperm whale. Topo is used to pick the location of the games in the baseball bat style. There is a parade of fish starting the games. The first event is a fencing match between swordfish. Then there are flying fish jumping hurdles. There is a boxing match between a walrus and octopus. Whales put out a flaming ship. Seals play a water polo game. Eels and crabs form grappling hooks for the salvage contest. A whale upsets a powerboat in the "stopping smugglers" event. Aquaman's luminous fish fail to stop smugglers. Various fish participate in an underwater tug of war. Dolphins participate in a relay race. Aquaman addresses his losing team at the end to congratulate them for their self-sacrifice. The games are reported as the "1960 Underwater Olympics". There are thirty events and a point system would be used to decide the winner. The games are held in the Atlantic, 500 miles north of Puerto Rico. There is a very very good reason that Aquaman's Atlantic team loses to Aqualad's Pacific team.